I have been in the planted tank hobby for about 3.5 years now, however am new to keeping Discus. Love the fish and want to make sure I know how to take care of them. I am putting them in a planted tank and understand that will require extra care. Please point me to links, articles that can help me and if you have a planted tank with Discuss, please educate me on the care that you take to ensure that your fish are in the best of health. After that still you need anything more let us know. Thank you for the quick response Abhis9. I read the sticky a couple of weeks back. I was more interested in knowing what were the extra things that I had to be mindful of when introducing them to a planted tank. So far, I have taken care of the following. I looked at the shape, coloration and reactions when I went to pick them up. They are in a holding tank, with a heater and water temprature at 28 - 30 degree centigrade. I have a sponge filter with a weak powerhead and the fishes are mobile and are eating well. They have good coloration. The red malboro is a juvi and I particularly checked to see that its coloration was good but not too much which showed that all the fishes are in good health. They are feeding well and are mobile. They are in a bare bottom tank right now and I wanted to know what I had to be careful of while moving them into a tank with cardinals, lemons, rummynose and denisonis. Since you are new to discus ( as you have stated ), it would be advisable that you keep them in a bare bottom tank and grow them out there. A bare bottom is easier to clean and maintain, and discus are very particular about the quality of the water. You may think of keeping discus in planted aquarium once you are sure that you have learnt all that there is to know about the fish, keeping them in a bare tank. This is just my humble opinion. You may wait and see what the experts suggest. I think that what you mention is a valid suggestion. However we cannot define a time when I will become proficient at keeping discus. Rather, what are the attributes of a proficient Discus keeper? I dont think even the experts will be able to prevent death, however they are good at pre-empting illness, know ideal conditions for discus and know how to match conditions to ideal conditions and also are good at reacting to an untoward situation. I know about ideal conditions and know that my discus are kept under near ideal conditions now. I know what would be normal behavior. I have read about plague, signs of sickness, treating bloating - though I dont have experience in handling any of these situations. I dont think I want to be in any one of these situations. Now I know this is basic knowledge. I am willing to get proficient but dont know the marker when I will be at proficient. If we can identify that then I know when to put them in the planted tank. Also the planted tank is different from bare bottom, therefore I am sure there are things that need to be kept in mind. That is also something that I am looking at. Folks who keep discus and consider yourself knowledgable, please point me to reading material. There are two stickys in the forum, out off which one I have read thoroughly. Get yourself a few 4" plus fishes that are used to eating dry food and try to provide 10 gallons of water for each of them. However it appears as if you are underestimating the demands of this fish especially in planted environment. We honestly do not desire a heartbroken fellow hobbyist. Good luck! 1. If your fishes are juvis then grow them in a bare bottom tank to 4-4.5". In this way your fishes are familiarized with the food habits and water conditions so when you shift them to planted they dont hide and stay scared. 2. If your fishes are big then again acclimatized them in a bare bottom tank and get them used to your food and water conditions. Again a dense planted tank provide lot of hiding place, a small territorial aggression will also send them hiding forever. This is one of the major reason why hobbyist avoid planted tanks. Your discus will grow big if they are well taken care of in no time so in a planted tank another challenge would be providing them with sufficient swimming area. So a densely planted tank would have very less area for them to move freely. I know discus are very tempting in a planted tank and I was also keen to have them in my planted setup so this is what I came up with after reading many articles. Here in the picture below I enjoyed these fishes in a planted setup thereby giving them their requirements. Aquarius, I am not underestimating. At this moment I dont have an estimate. The fish are in the bare bottom tank and I am trying to get them comfortable. I will transfer them into the main tank in a week and I wanted to know how much effort it would take. Posting pics of the the fish so that you can see for yourself how big they are, I would say the samllest is about 2.5 inches in breadth and still a Juvie. I am encouraged to see your planted tank and interested in knowing how you fed them in the planted tank. I have some denisonis and tetras in the tank and am worried, these guys will find it difficult to feed as the other are faster fishes. Please talk more about your planted tank and care regimen for the discus and pointers on issues that might crop up. 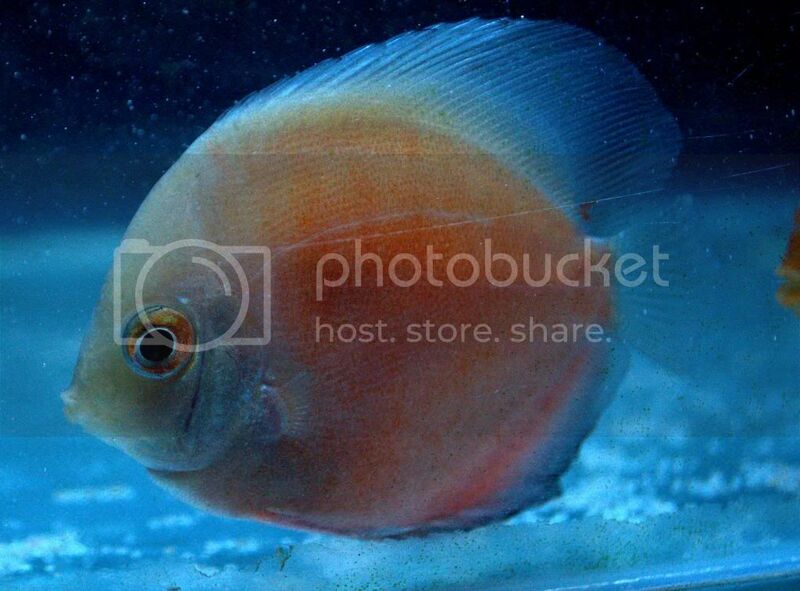 You have some fast moving fishes already and Discus as commented by experts is a shy fish. You can have them alone in the planted tank as they have lots of issues of there own for you to take care. @ sam22sam...Its good to have Discuss in planted aquarium...things to consider. 2) Go for low tech tank..i.e. plants that needs less C02....don't play with CO2 attempting for dense carpet in Discus tank. 3) Go either for Discus only planted tank...as everyone said discuss are shy fish and if you have active schooling fish that would consume food fast making your discus starve. 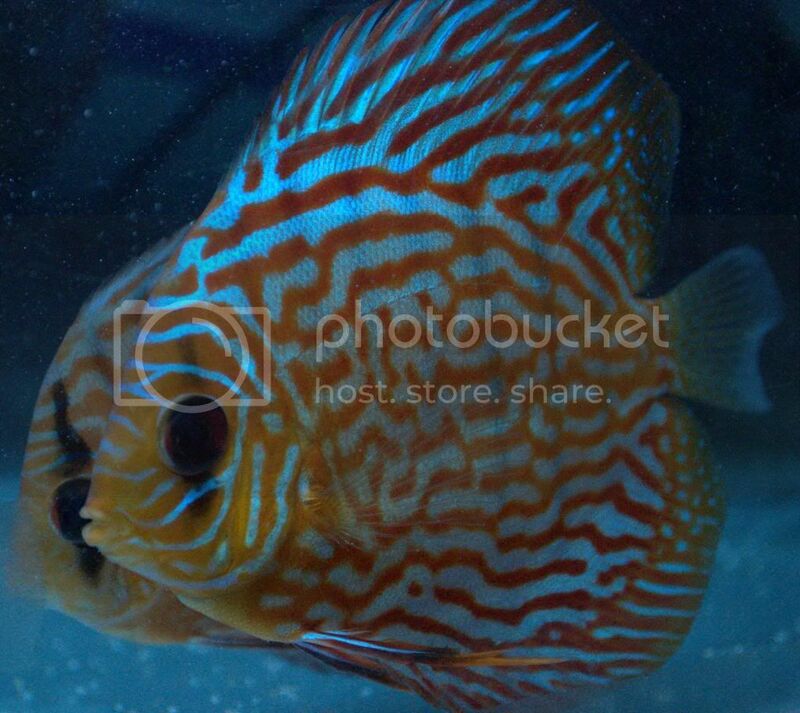 I am keeping discus last 20 yrs. Really they are King of Aquarium. I have 3 tanks for Discus and also I have 2 planted tank. I learned lots from hands on experience. For bloating, separet the fish and treat with Magnessium Sulphate with 30 degee temp. Personally I am against to keep Discus in high tech planted tank. Why, because high light, CO2, fertilizer dosing, low temperature, keeping with fast moving fish etc. all goes against Discus. Swarnendu already give you the hints. Anyway it's totally up to you. ok. Just checking and I am not trying to argue but clarify. I defenitely want to try this, I intented the tank after doing a bit of research and had enough examples of tetras and denisonis with Discus. I want to make a checklist of things that I have to be careful of and your inputs are defenitely helping. The fast moving fish are also in their Discus's natural environment also. They are found in nature with Tetras, Cory's etc. The Denisoni are the only fish that are not a part of the Discus's natural environment and I can take them out if the Discus are getting stressed but I have seen plenty of tanks with Discus and Denisoni's on the net. I will keep open the option of taking out the Denisoni's in a worst case. The starvation part also worries me but that is something I will attempt and if I see that the Discus are not getting food, will separate the discus out within a week, in a worst case scenario. The difference is light, I agree and I have given shaded are in the tank with aromatica to ensure that they are able to move to the shade when stressed or need some off from the light. Will this work? Co2, this occurs in nature also. at the same levels, in some places at higher levels also. The Co2 is at 2bps and is in safe levels. The tank has been up and running for about 8 months now. I do understand that, I can have mishaps with co2 pumped in and I am putting in a solenoid for safety. Is there anything else that I can get for safety? The temp of the tank is current at 28 and above it being summer. The plants are other fish dont show distress. I will have to keep an eye on this during the winter. So, this point is defenitely on my checklist. The plants in the tank are crypts , ovalis, aromatica etc. It is a mis of open areas and shade. Point noted on rescaping, I will put the discuss in only after the scape is full and I dont have to put my hand in. I only have Glosso as foreground right now and in a worst case, I can think of redoing the scape after taking the Discus out, but this is only a worst case. Triming happens every 2 to 3 weeks and just before a water change. If I limit frequency of messing with the scape only every two or three weeks, do you think this will work? Again I am not trying to argue, but clarify because I defenitely want to try this but ensure that I have measures in place for a worst case or ensure that I can pre-mept or react quickly to a event. I practically had all the fish you mentioned with Discus in a densely planted tank. I never had any issues, but things to consider. 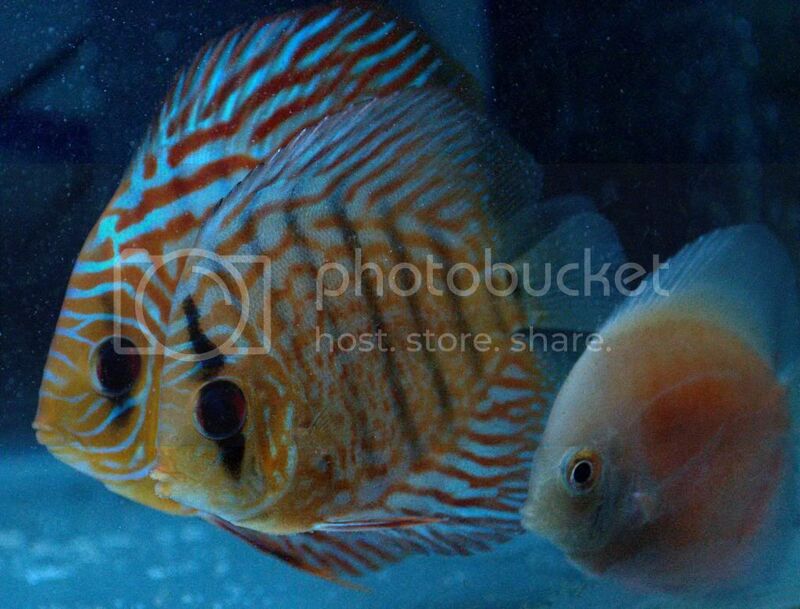 Discus are predatory in nature and will hunt down small fishes and shrimps. The size of the discus you have is good to start with in a community tank. Add discus of same size together...if you have plans of adding few more discus later on...hold on. discus have pecking order once establishing in an aquarium, they would drive off new discus added later on and make them starve for food and eventually kill. As for as you are prepared to spend some extra care for discus in planted tank, you will succeed having them, make sure enough food in left in the tank for discuss to feed as the tetras and barb will try to complete them before discus get a chance. But once the fish feels at home i have seen discus taking food from surface as like other fishes, but initial assimilation is what you have to look for. And coming to CO2, you may get tempted to add carpeting plant at later stages or you may need to battle with algae and people will advice to increase CO2...having discus in your planted tank you should be cautious. Don't attempt to take out Discus once it get accustomed to the aquarium you are more to stress them out. Majority of mortality with Discus happen due to stress. Now that is really encouraging. Thank you!! I promise to be patient!! I have 3 fishes in a group that have been together for a year in a tank with their previous owner. I want to keep 4 to 6 Discus in the tank, do you think, I will be able to add new ones now or will that result in conflict? If I can keep more fish, how do you suggest I do this?